Las Vegas police are investigating a robbery of the Sahara Hotel and Casino poker room that apparently took place at 6 pm on Friday night. Police are saying that one or more robbers robbed the poker room itself, and not the individual players sitting at the tables. One can only assume that this is because the robbers had very limited time to make their getaway, and robbing individual players would have been far too time-consuming. Also, players would have likely gotten much better looks at the robbers, which would have made their identification by patrons of the establishment that much easier. There has been no indication as of yet as to how much money was stolen. Las Vegas casinos are usually pretty tight-lipped with this information, as they don't want to let would-be robbers know how much money is in the establishment. Police have also not yet revealed what type of weapon was used. Many people are surprised that such a robbery took place, given the amount of security (and security cameras) that are utilized in Las Vegas. 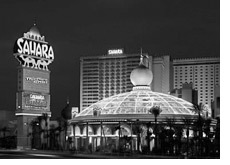 Independent Vegas sources claim that the Sahara was chosen due to the fact that it is a slightly older establishment and might not have top-of-the-line security, especially compared to rooms like the Bellagio or Wynn. Was this a very budget version of Ocean's 14? Robberies of poker rooms in Vegas. Multiple home game robberies. Is it any wonder that more and more people are just choosing to stay home and play online? We'll have more on this story as more details become available.